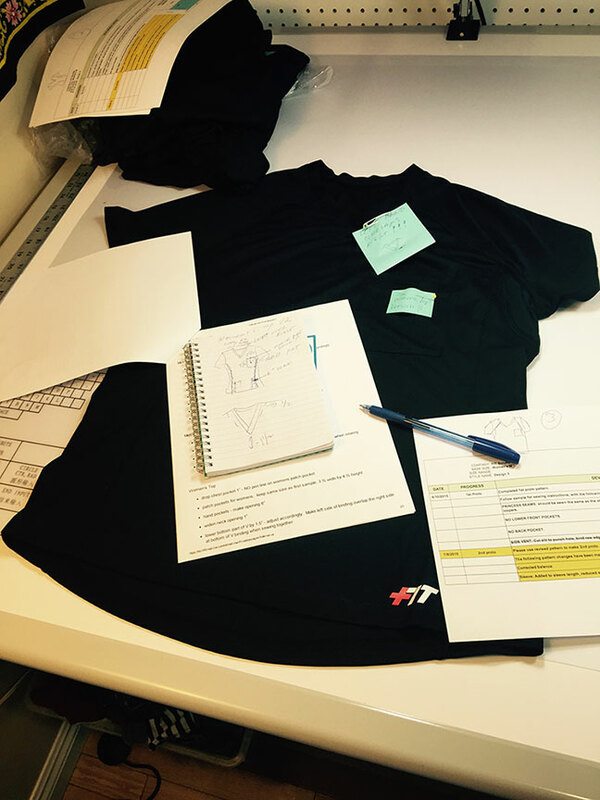 Indie Source brings FIT Scrubs’ innovative design concepts to life – a real life success story. Founded by 14-year emergency department paramedic Arthur Lucero, FIT Scrubs (a division of PurFit) intends to revolutionize medical scrubs by creating performance garments that work for medical professionals. Discouraged by the typical scrubs that saturate the medical field – uncomfortable, poorly-sewn garments made of impractical fabrics in gimmicky prints – Lucero had a vision of creating moisture wicking, antibacterial, antiodor, comfortable scrubs that truly perform for the professionals who wear them every day. As a new dad, full-time undergrad student, and former paramedic, Lucero was completely new to the fashion business. His motivation and inspiration to create something new that would make a huge difference in his profession compelled him along a challenging product development and manufacturing journey that (luckily!) brought him to Indie Source. We are thrilled to partner with FIT Scrubs in the production of their line. Below, we’ve excerpted Lucero’s blog post Concept to Creation, which details his inspiring journey from burned-out paramedic to fashion innovator. In November of 2013, I resigned from my position as an ED Paramedic at Providence Tarzana Medical Center due primarily to burn out. Fourteen years of emergency medicine had taken its toll and I was developing some very unhealthy coping mechanisms, which I’ll dive into greater detail in another post down the road. I’d instruct CPR/ACLS/PALS, part time, here and there but that wasn’t enough. I can’t really describe it but my breakthrough moment was some internal voice, that I use to rarely listen too, tell me I can make scrubs better than anyone else can, and after further investigation of what was currently available in the medical uniform world, I felt there was a deficiency in the scrub market with regards to active wear scrubs . However, I knew nothing about starting a business, intellectual property, flat sketching, tech packs, concept boards, manufacturing, sample development, business scaling, distribution channels, social media and so on. In fact, the only subjects I really knew was the hospital culture (the consumer), and textiles. Ever since the conception of FIT Scrubs concept, I had began researching the science and technology that went into a “performance” fabric. How was it constructed? What properties made it moisture wicking? What are the different types of blends and how are these blends made? Whats the process? What’s the difference between knit, woven, non-woven and laminates? Essentially, I wanted to know the anatomy and physiology behind the fabric. Ends up, textile science is just about as deep as medicine when it comes to the education and research that goes into textiles. And for a good reason, performance textiles, like our skin, do a whole lot more than just have a nice color and feel to them, they are working for you. The moisture wicking, fluid resistant element is similar to the dermal layer of our skin. My mission was to find all the pieces out there by knocking on as many state of the art textile companies and bio tech doors I could, in hopes that I could convince them to help me create a blend of fabric that was moisture wicking (hydrophilic), antibacterial, anti odor, anti wrinkle, fluid resistant (hydrophobic), breathable, comfortable, stretchy and felt protective, just like our skin. Not as easy I thought it was going to be, however. I realized pretty quickly, I had no clue as to how to even go about approaching an advanced textile company, let alone a bio materials corporation. But if this was going to be my trump card, the core of my apparel, I knew I was going to have earn it. Because if it was easy, it would have been done already. I knew my biggest challenge was just getting my foot in these places door. There are fabric reps who do this for a living btw, and its not to uncommon for these reps to make six figures a year for the work they do considering fabric sourcing is an instrumental component to every successful apparel company, so little ol’ me, had his work cut out. Finding the mills was one thing, getting them to engage with a young, inexperienced, start up business owner with a great concept was another. So I took to LinkedIn, updated my profile, got it streamlined and began searching the companies through there. I’d get some hits by directly InMailing the key players but the bottom line was that I had no skin in this apparel game. I had nothing to offer other than risk and liability. I’d send multiple emails to the company’s “inquiry” web page but nothing. It wasn’t until I came across a site called www.materialconnexion.com that really helped catapult my progress. It had a pricey subscription fee to utilize its services but it was insignificant in the grand scheme of things. The greatest feature was that it gave me direct contact to the folks responsible for creating the blends I needed, in addition to providing a vast network of technical mills that were willing to work with small start ups such as mine. To make a long story short, I found what I needed, that find was this respective start up called PurThread Technologies based in the textile hub of Charlotte, North Carolina. I went through the antimicrobial gambit of companies all providing an effective product but this company had the winner. Similar to the silver antimicrobial thread used in yoga/active wear brands like Lululemon uses for its long lasting odor control (their slogan is “Get the funk out”), PurThread had developed a proprietary process of utilizing the EPA approved silver from their partner, Kodak, and embedded it within their thread to produce a long lasting, integrated antibacterial fabric, which has been clinically proven to kill MRSA, Staph and other Hospital Associated Infections (HAI) upon textile contact within 2-4 hours with a 99% efficacy, backed by a surplus of clinical trials.
. By actively collaborating with all the mechanisms that are involved in creating innovation in regards to bio technology, performance, consumer feedback, science, design and implementation, it’s happening. To read the full version of Lucero’s post, please visit the FIT Scrubs Blog.